This came to me in an email. I have no way to track the picture back to its owner, so if anyone knows who took this picture please let me know. There are so many warnings out there about dogs that are considered a “dangerous breed.” I don’t subscribe to that thinking, but when I saw this picture I thought it should be shared immediately. If you are an owner of a dog that belongs to a ‘dangerous breed’ category and you also have a small child, please take this as a warning. 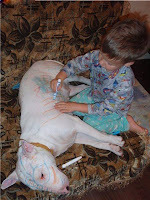 Don’t leave your dog with the child unattended under any circumstances. It only took a moment for this to happen! Told you it would bring a smile! One thought though – oh please let these markers be water soluble!